The Helmeted Hornbill is the largest of the hornbills and is named for the helmet-like protrusion on the upper half of its beak. This casque is a solid block of ivory-like substance and quite unlike the casque of other Hornbills, which are typically hollow. The beak of the Helmeted Hornbill is red and yellow. They have dark feathers on the wings and most of the body but there is a featherless patch of leathery skin on the neck, which is a reddish brown in males and turquoise in females. They have extremely long central tail feathers (up to a metre long) which are white with dark bands. Both males and females of this species have horns. Females’ horns are rarely longer than 33cm, whereas adult male’s horns are far more striking. At up to 127 centimetres long, they curve upwards and backwards from the head in an arc shape. The diet of Helmeted Hornbills consists mostly of fruit. 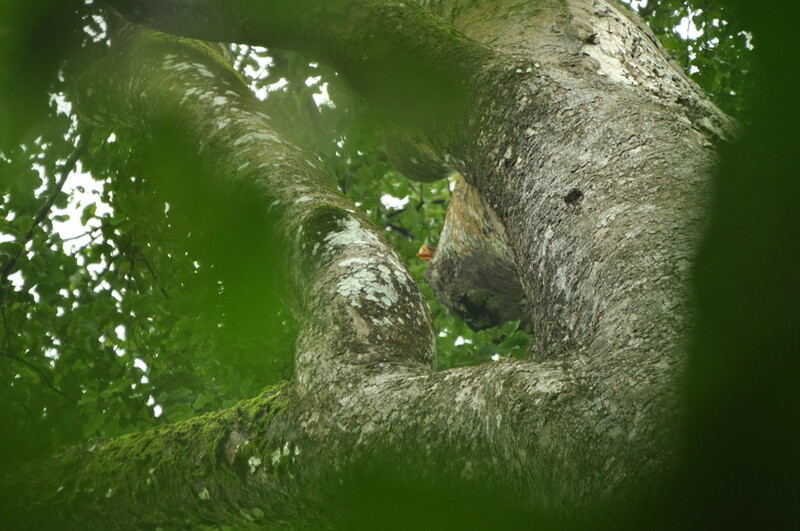 Aerial jousting has been observed near fruiting fig trees, suggesting that the birds are fighting over access to figs, seemingly their favoured food. Fighting individuals collide in mid-air, their casques clashing, often resulting in one or both hornbills being flung backwards, before righting themselves again in flight. Like other hornbills, adults form breeding pairs and exhibit peculiar nesting habits. The pair build a nest in a hollow tree and seal the opening with mud, faeces and food remains – with the female inside. Only a small hole is left, through which the male passes the female regurgitated food, while the female incubates the eggs. Helmeted Hornbills have an unusual call that is unique to this species: a series of notes sounding like ‘took’ followed by what sounds like laughter. 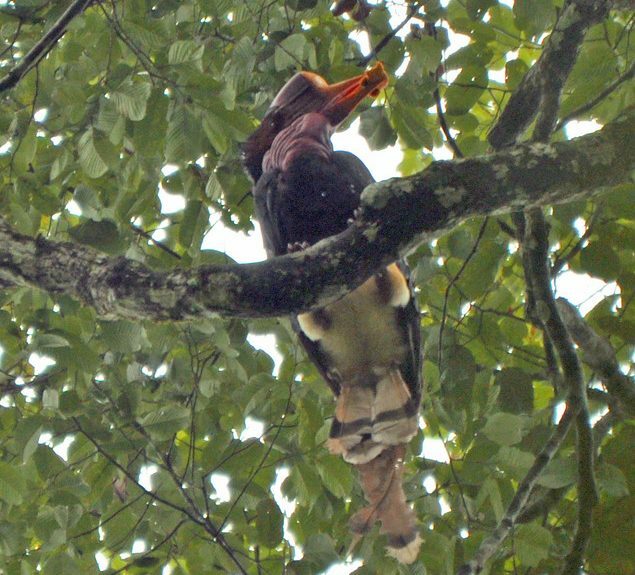 The Helmeted Hornbill occurs in forested areas in Myanmar, southern Thailand, Malaysia (Sabah, Sarawak and Peninsular Malaysia), Indonesia (Kalimantan and Sumatra) and Brunei. Helmeted Hornbills occur only at low population densities and are threatened by the rapid rates of forest loss. The escalation of illegal logging and land conversion, as well as forest fires, reduces the area of suitable habitat for the species. The bird is also prized by hunters.